3.) 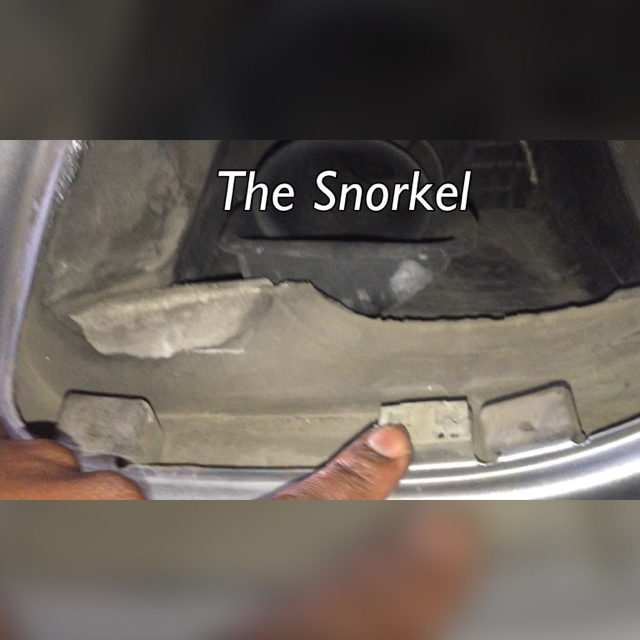 Inside the drivers side air duct you will find a snorkle... The snorkle is added to most US cars for noise restrictions. Now this piece is attached by no screws or tabs, but it most likely will give you some troubles removing... The best way is to remove this, just grab a hold of the long snorkle (not the small dish on the end)... Now wiggle it from left to right and vice versa while pulling out towards you. This works, but might take a little effort. 4.) 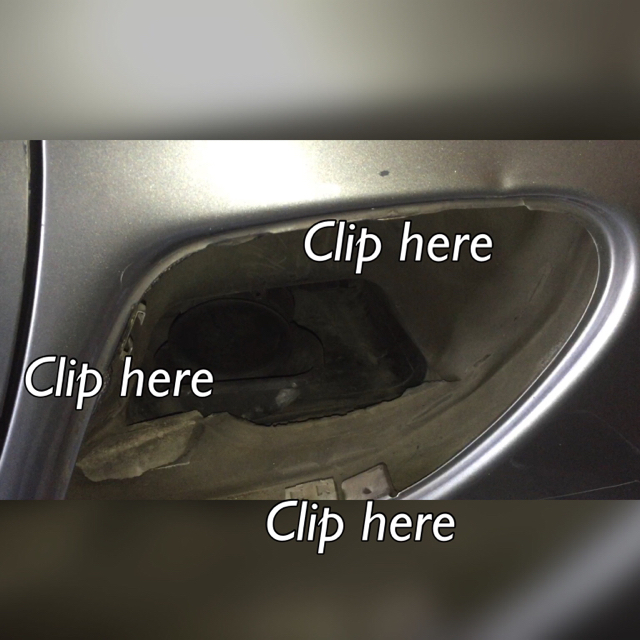 This is what the intake is going to look like after the snorkel is removed... Just carefully insert the three tabs back into their points... Make sure that all three are tightly in by pushing the airduct cover (not the grill)... Insert your 1 screw into top center of cover and you are done. Thanks, Ohana for the write up. You are very correct about the delicate plastic tabs. 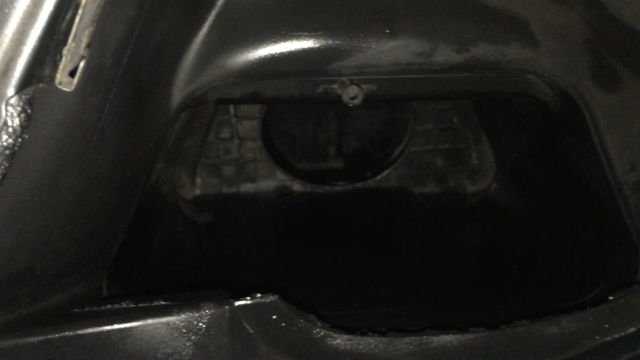 Mine are completely broken on the engine cooling (passenger) side, and 2/3 broken on the intake (driver's) side. Really the grills are just held on by the upper screw. Makes me wonder why they didn't just use additional screws and do away with the flimsy plastic tabs that are built to break. And they cost $60 each to special order from Suncoast. 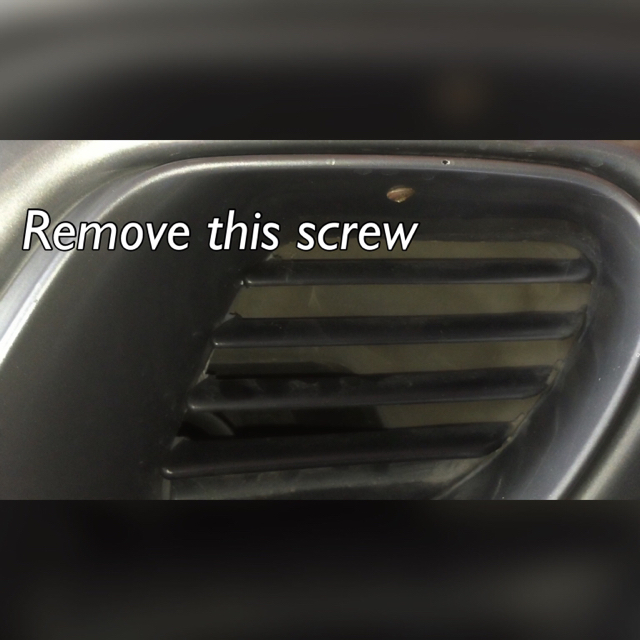 I will also add there is an inner screen (to keep cig give butts and the like out of the intake) on the 986.2. This is easily removed with one screw. Now, on the result of desnorkling - I have to say I was hoping for more. I'd say it is not noticeable on start up, idle and lower revs. Above 4K, I think there is a small, but noticeable deeper note. i'm not shure if that desnorkling has any advantage at all. The snorkel has a specific length and volume. So it is optimized for a specific resonance. Also the intake part of the snorkel has a rounded design. Also the me that is not a restrictor, because the diameter at the end of the snorkel is the same. And even if it is a little smaller at the start this helps to optimize air flow. Would be interesting to put the car on a dyno and see if there are differences with and without snorkel. I suspect the performance graph will be more balanced with snorkel. 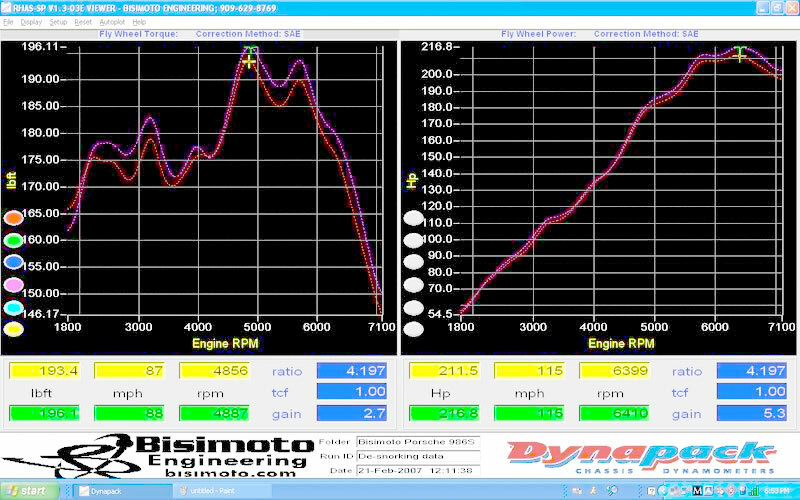 It's has been dyno'd by bisimoto back in 2009 at his shop, he provided proof of the small increase in WHP & Torque . Look it up you'll see the document. I removed my snorkel only to get a more pleasant sound experience. This is a great guide. Because i couldn't see the graph i color corrected it. The biggest hp difference is above 6.000 rpm. Not the rpm speed range i'm often. There is a difference in torque. If you look very careful you'll see a loss below 1.800 rpm. That is a rpm speed range i'm often. I think if you really want more sound from the air intake i think you'll have to redesign the snorkel in a way that it looks like a trumpet. I'm seeing a lot of room in there. Can also picture an electric blower controlled by Pulse Width Modulation (PWM) hooked up onto the RPM range signal (tapped in the ODB or something). Read poor man's SuperCharger, would that work?! Poor man's supercharger... Here you go!